A soldier launches a small unmanned aerial vehicle complex "Zastava" during the teaching of complex tactical artillery and reconnaissance units 83rd Guards Paratroops Brigade Airborne in the Primorsky Territory. RBTH investigates whether it is possible to launch a quadcopter over Red Square and why the law still catching up to robots. Russia is becoming an active participant in the global unmanned aerial vehicles (UAV) market and is thus accelerating the development of domestic laws in this field. With the appearance of an enormous number of various domestic drones, which are sold without any jurisdiction, the government cannot always control their movement. Many incidents of these "toys" being found near airports or in areas where fire aviation aircraft are in operation are examples of this phenomenon. The situation has worsened in the last two years following the release of inexpensive Chinese-produced quadcopters onto the market. "The majority of countries in which such technology can be used is facing this problem, including technologically advanced nations such as the U.S. and the EU countries," Denis Fedutinov, a leading Russian UAV expert, told RBTH. 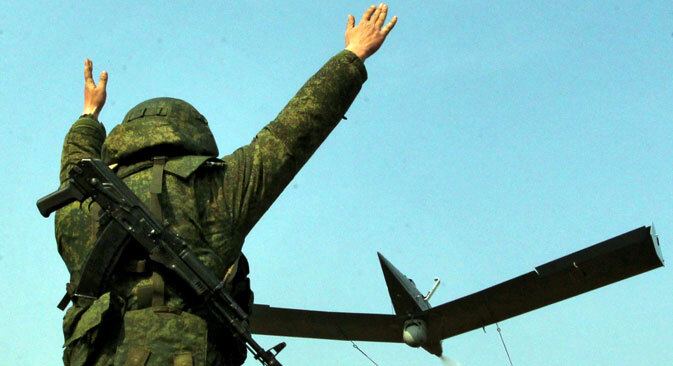 In Russia the issue of using UAVs was mentioned in "The Federal Rules on Using Aerial Space." According to this document, to use a normal remote control helicopter, one needs a flight diagram and permission to use aerial space, which are impossible to obtain without a certificate of airworthiness and a permit to operate. To take photos using an UAV one needs to obtain permission from the FSB security agency and the Ministry of Defense. This explains why a private individual who launches an unmanned helicopter to photograph Red Square, for example, could be fined. Nevertheless, many people in Russia still use UAVs. An entire industry of aerial photography has taken root in the country and hobby drones are selling very well. Such a contradiction between reality and the law restrains the development of all areas of the industry, from production to the usage of unmanned vehicles. However, the process is moving forward, if rather slowly, Fedutinov says. A range of factors is helping it along. First, there is the awareness of the fact that there are many situations in which using drone technology is economically more advantageous than manned technology. Secondly, the world civilian UAV market is estimated at several billion dollars. And thirdly, the development of the civilian UAV market is capable of making existing systems cheaper and creating new technologies for unmanned systems, which would be of interest to both civilian and military operators. At the beginning of June 2015 the State Duma examined and passed a bill in its first reading on introducing changes to the Russian Air Code, which acts as a legislative foundation for using UAVs in Russia. According to the document, all apparatuses weighing more than 30 kilograms must be registered and using such UAVs will require a certificate of airworthiness. The law is currently being reviewed. While UAVs are becoming a part of our lives, unmanned cars are still on their way. In Russia the most promising project is an unmanned truck being developed by the KAMAZ truck company. Representatives from the Russian company say unmanned trucks will replace 300 transportation units on intrafactory routes by 2019. Currently, experts believe that unmanned cars correspond neither to Russian legislature nor to the condition of Russian roads, which often do not have any markings or signs. In order to legalize such cars significant legislative changes will have to be introduced to regulate street traffic. The pace of technological progress does not always permit lawmakers to keep up with these changes and then accurately reflect them in the law. In Fedutinov's opinion, this is mainly due to the novelty of unmanned systems, since the existing regulatory and legal framework concerning the use of technology was created for technology operated by humans.